Unusual Vintage Pottery Umbrella Stand w/Applied Grape Vine & Bird on a Nest. 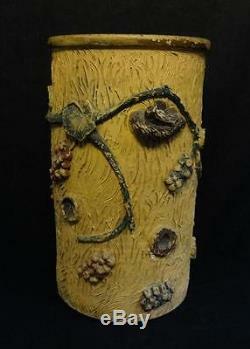 For sale we have an Unusual Vintage Pottery Umbrella Stand w/Applied Grape Vine & Bird on a Nest. Piece is in excellent condition. Measures 20-7/" tall 10.5" base, 11.75 opening. We ask that all items be paid for in a reasonably quick time-frame. This covers the expense of boxes, envelopes, bubble wrap, peanuts, etc. If we use a private company the package may not be marked as insured but we guarantee you it will be properly insured. Or at times, an item may be too large for any other options. We represent over 65 individual dealers who supply us with the items and the appropriate descriptions. We make every effort to vet our items prior to listing by researching them to the best of our ability. Unless we are out of town we make an honest effort to answer all emails as quickly as possible. Get Images that Make Supersized Seem Small. Auctiva's Listing Templates improve your auctions in minutes. Attention Sellers - Get Templates Image Hosting, Scheduling at Auctiva. Add a map to your own listings. The item "Unusual Vintage Pottery Umbrella Stand withApplied Grape Vine & Bird on a Nest" is in sale since Monday, December 14, 2015. This item is in the category "Pottery & Glass\Pottery & China\Art Pottery\Other American Pottery". The seller is "planetantiques55" and is located in Columbia, Pennsylvania. This item can be shipped worldwide.